Experience the thrill of riding or driving an ATV through the woods at The Shepherd of the Hills. With the Ozarks as your backdrop, choose the guided trail excursion that meets your needs and get ready for pure adrenaline! All ATV adventures are guided by a trained staff member. To ensure the safety of all guests, helmets must be worn and drivers must be 21 years of age with a valid driver's license. Drivers must be 21 years old and have a valid driver's license. Children 3 and under will not be allowed on the ATVs under any circumstances. All passengers must wear a helmet. Trail adventures are guided by a Shepherd of the Hills staff member. Car seats are required for children based on Missouri State limits. Safety restraints and helmets must be worn throughout the entire experience. Book your excursion now! That’s right, you can take your family off-roading in some of the most technologically advanced UTV’s the world has known with the CanAm Commanders and CanAm Mavericks. 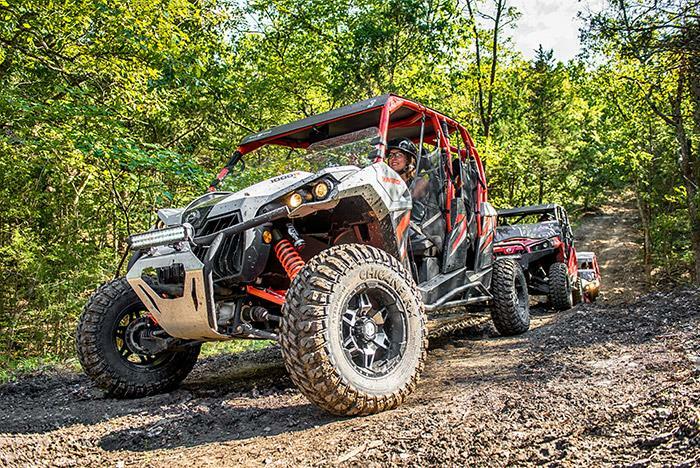 We offer a 1-hour excursion that includes some time for instruction and learning how to operate the ATV/UTV’s on the pavement before heading off-road into the Shepherd of the Hills trails for approximately 30 minutes of backwoods adventures. 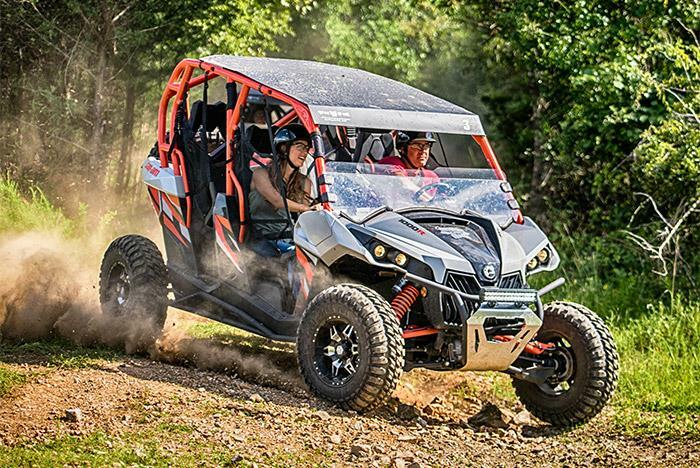 If you're looking for more action, we offer a 1.5-hour excursion with one hour of deep off-roading that’ll make the hair on the back of your neck stand on end. 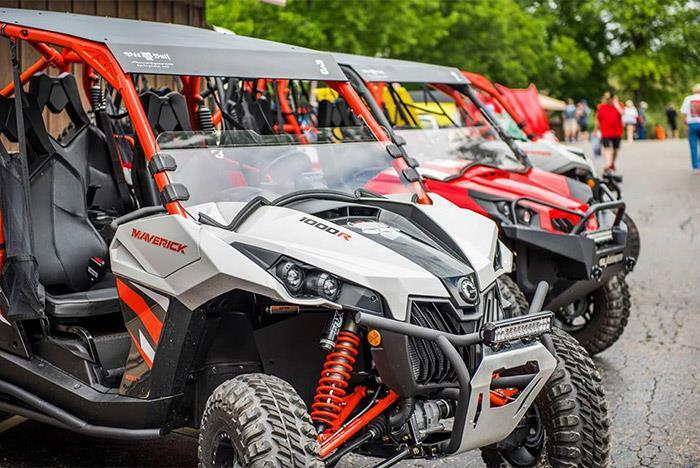 We will start off with some time for instruction and learning how to operate the ATV/UTV’s on the pavement before heading off-road into the Shepherd of the Hills trails for approximately 1 hour of backwoods adventures. 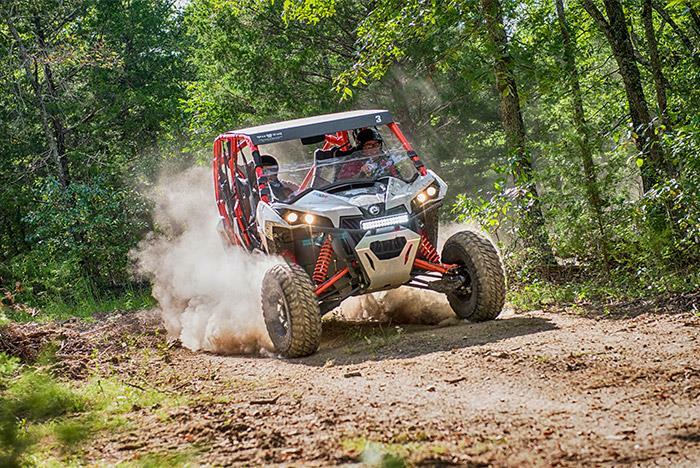 You will follow a guide and drive your own UTV through the many trails offered at Shepherd of the Hills. 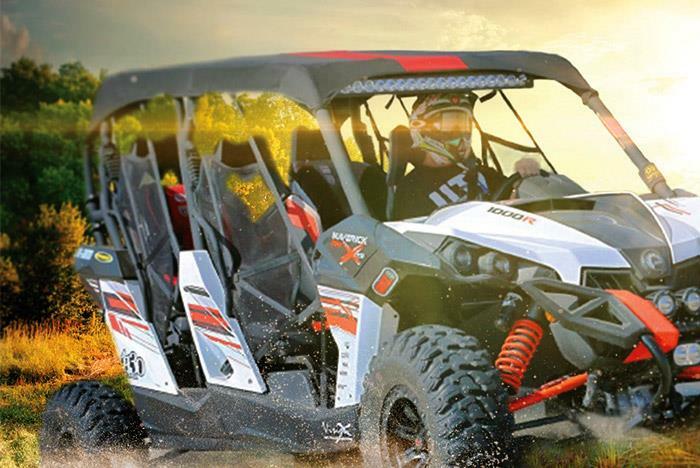 Each UTV can hold up to three passengers and one driver. Please arrive 30 minutes prior to departure time to fill out paperwork. Weight limit for ATV riders is 300 lbs with a total weight limit of 900 lbs per ATV. Trail rides are a guided adventure through our property, led by Shepherd of the Hills staff. Must be 21 years old to drive with a valid drivers license. Weight limits vary and your own car seats are required based on Missouri State limits. Children 3 and under are not allowed on the ATV's under any circumstances. All participants must wear safety helmets (provided) and use safety restraints at all times. Anyone caught endangering themselves or others with horseplay will be removed and forfeit all fees paid. How old do I need to be to drive an ATV? Drivers must be 21 years old with a valid driver's license. Children 3 and under will not be allowed on the ATVs under any circumstances. Yes. All passengers and drivers must wear a helmet and the provided safety restraints throughout the ATV adventure. What are the Missouri State car seat limits? Per Missouri State law, a child must be in a booster seat if they are ages 4 through 7 and weigh at least 40 pounds, unless they are 80 pounds or 4’9” tall. Children less than 4 years old or less than 40 pounds must be in an appropriate child safety seat. How long are the excursions? Guests can choose between a 1-hour or 1.5-hour excursion. Are we taught how to use the ATVs? Yes. Part of your experience includes ATV instruction. Please wear outdoor clothes. There is a possibility of getting muddy or dirty during the tour. Is there a certain weight limit for the ATV tour?